Mammal recording was introduced to the BBS in 1995 with a view to help improve our knowledge of the distribution and population trends of some of our commoner mammals. Compared with birds, the population trends of mammals are relatively poorly known. Even though mammal recording has always been a voluntary addition to the scheme, 91% of BBS observers now actively look for them during their BBS visits. Download the instructions for monitoring mammals on BBS. BBS count data are used to calculate population trends for nine relatively widespread mammal species, shown below. These trends cover the period 1995–2017. In 2017, 3,567 of the 3,941 BBS squares surveyed, mammals were actively recorded. In 2,974 squares, live mammals were seen and counted, 436 squares found no evidence of mammals and, on 157 squares, only indirect evidence was seen, such as field signs or via local knowledge. 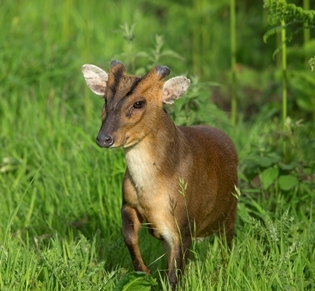 Of the nine mammals for which trends can be produced from BBS counts, two have increased significantly in the UK as a whole since 1995: Roe Deer (81%) and Reeves' Muntjac (117%). Trends for herd mammals, for example, Red and Fallow Deer, should be interpreted with caution. This is because the presence or absence of a herd in a given BBS visit could heavily influence the overall trend for that species. Two mammals have declined significantly: Rabbit (60%) and Red Fox (41%). The drivers behind these declines are unknown. More information on the mammals recorded during the 2017 BBS surveys can be seen in the latest BBS Report (pages 28-29). The information on species detected more often by signs of their presence than by sightings (e.g. Hedgehog, Mole and Badger) can also be used to estimate trends, although these require more careful interpretation. • This table shows unsmoothed trends (in bold) and sample sizes (normal font). • Population changes are shown for mammal species for which the sample size is at least 30 squares. • Trends are percentage changes, and are marked with an asterisk (*) where significant at the 95% level or more. In 2011 the JNCC funded work to compare BBS mammal trends between 1995 and 2009 with another annual scheme: the National Gamebag Census (NGC), carried out by the Game and Wildlife Conservation Trust. The NGC is a voluntary scheme that collects bag statistics from shooting estates, on average about 650 per year. The aim of the project was to produce an overview of trends in abundance and distribution. Of nine species tested, none differed significantly in their trends between the two schemes. For four species where BBS indicated significant increases between 1995 and 2009, the NCG trend was either not significant (Red Deer, Roe Deer and Reeves’ Muntjac) or alsoshowed a significant increase (Grey Squirrel). Rabbit showed a significant decline on BBS whereas NGC found no significant change. This work demonstrated the feasibility of producing joint BBS-NGC trends for assessing population change for statutory purposes where a single figure is needed. Results of the spatial mapping were also useful, inshowing areas where species are most often detected and where the most marked changes had occurred. However, due to differences in sampling design and methods, the recommendation is to routinely report temporal and spatial results from the two schemes separately.